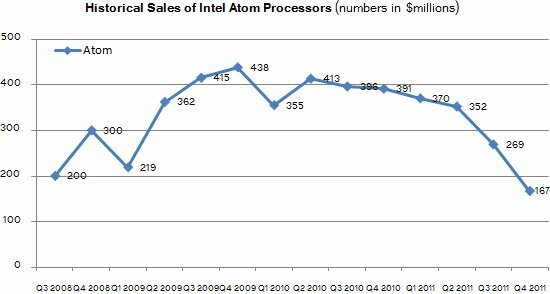 X-bit Labs reports sales of Intel's Atom processor have hit an all-time low in Q4 2011. The chip giant pulled in $167 million of Atom sales, a far cry from the $438 million peak achieved two years ago. While Intel Corp. is facing great demand towards its advanced Core i-series "Sandy Bridge" microprocessors, the firm of witnessing rapidly dropping demand towards its low-cost/low-power Atom chip line. In Q4 2011 sales of Intel Atom hit all-time low, which is another evidence of dropping popularity of netbooks and ultra low-cost PCs powered by Intel in general. Based on Intel's financial report, the Atom micro-architecture revenue, including microprocessors and associated chipsets, was $167 million, down 38% from the third quarter and down 57% from the fourth quarter of 2010. Apparently, even despite of the beginning of revenue shipments of Atom 2000-series "Cedarview" chip, overall sales of the product family fell significantly. According to the world's largest chipmaker, Intel Atom micro-architecture revenue is down as a result of lower demand for netbooks, inexpensive small form-factor mobile computers with limited performance and capabilities.